What are the benefits of Commercial Solar? Stabilise electric supply and reduce cooling overheads in summer. The Feed in Tariff (also known as the FIT) is a Governmental policy mechanism that is designed to encourage the use of renewable energy sources in the United Kingdom. It was first introduced in Europe (Germany) where it has led to the installation of roughly 30GW of solar PV, including a remarkable 2GW in the UK. Solar PV has been successfully introduced into 63 countries around the world, including extending into much of Europe. It guarantees a Feed-in Tariff (FiT) payment per kWh (unit) produced, which is index linked and subject to inflation, regardless of whether the electricity generated is consumed on the premises or not. Whatever electricity you do not use (which saves you on your electricity bill) is exported back to the grid at a guaranteed minimum of 4.85p per kWh. The FiT is financed by your energy provider and the implementation of the FiT means that a return of 10% – 20% is now possible on investments in commercial Solar PV systems in the UK. 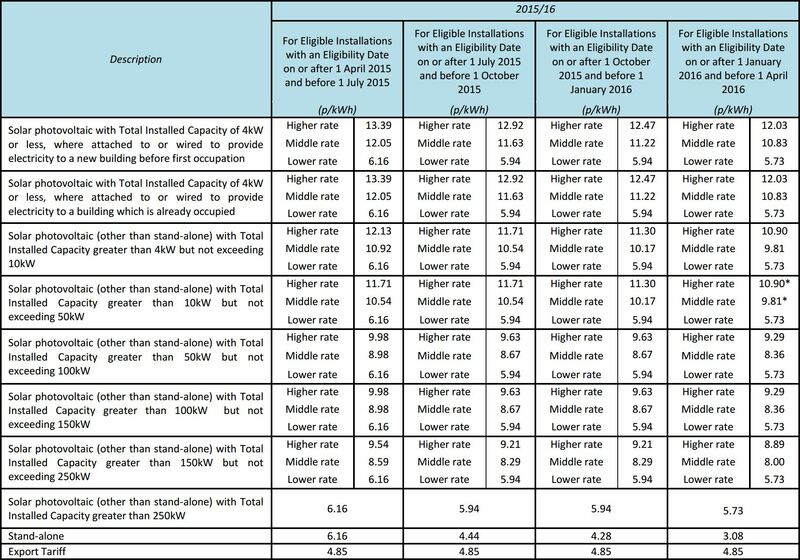 Here are the current rates for the Generation Tariff from April 2015. Another thing that should be taken into account when considering installing a large scale commercial solar panelPV array is the aesthetic impact it will have on the surrounding area. Though less conspicuous than wind turbines, solar fields have still provoked very strong opposition by groups concerned over their effect on the landscape. The ability to obtain planning permission is therefore a central consideration when thinking of installing a solar field, because unlike small domestic or commercial installations, all large scale projects will require planning approval from the local authority. The ultimate planning decision will be based on a range of factors, including visual impact (glare, etc. ), the potential benefits it could bring to the local community, the array’s impact on the local ecosystem, as well as the local electricity grid connectivity. There will be a planning application fee, usually dependent on the size of the proposed site (sometimes these can run to six figures, to a maximum of £250,000); each local authority will have its own guidelines on this. The LA will also perform a site visit when assessing a planning application, as well as gauging the local reaction to the proposals. As well as being an attractive proposition for homes and business owners who want to save on energy bills and produce clean energy, solar PV technology is increasingly becoming a popular way of profiting from larger pieces of land. More and more landowners across the UK, especially those in southern England where solar irradiation is at its highest, are installing PV panels on their land in the form of large scale (often up to several megawatts) solar fields (sometimes also called solar parks) in order to benefit from the government Feed-in Tariff (6.85p/kWh for standalone installations of up to 5MW). This can either be done through so-called ‘solar developers’, who install and maintain panels on a piece of land and then pay an annual rental fee to the owner out of the FiT income, or landowners can choose to have a PV installation company install the array and then arrange to sell the energy produced to electricity suppliers. Such schemes are especially popular with farmers, many of whom are looking to diversify their businesses as certain farming sectors become increasingly unprofitable. In many cases solar fields offer a more reliable source of income than that offered by traditional farming, as the Feed-in Tariff export and generation payments are guaranteed for a period of 25 years. As with smaller systems, solar farms can, of course, also provide low-cost and low-carbon electricity for dwellings and other buildings. Though the exact amount of money to be earned from solar fields/parks depends largely on the amount of available land and other site-specific factors, the figures are often very attractive indeed. A common figure quoted is that developers will pay rent of around £1,000 per annum per acre of land used for a solar field installation which in many cases will be higher than the normal rent value of the land. For those landowners who chose to install the PV array themselves the income is sure to be even higher, though obviously this option presents a slightly higher financial risk. The Feed-in Tariff rates available to large scale solar PV arrays are available in the table above. It should be remembered that though FiT income is often tax-free for individuals, it counts as taxable income for businesses. Farmers should bear in mind that income from a standalone PV array may impact upon the tax relief offered by the Single Farm Payment, so it is a good idea to check with an accountant before proceeding with the PV installation. The solar field installation itself will comprise the PV panels, frames, inverters and cables, as well as security measures such as fencing and even cameras for some larger installations. There will also be a central control and monitoring hut. Though regular checks of the array are required, PV panels have no moving parts, which make them reliable and durable. More information on the maintenance requirements of PV panels.